I have written about doing some de-cluttering at home, and wanting to re-do some areas of our apartment. Somehow, in a short 1.5 years, things related to Bubbles seem to have magically multiplied many times over. Our home is now full of things stamped "Bubbles". We badly need to re-organise and clear out stuff to make room. So, after 4 good years of hanging on to these wedding momentos, I have finally decided that they must go. 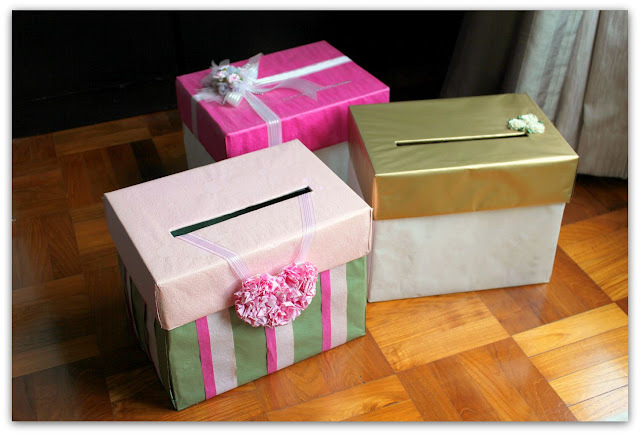 These are the angpow boxes that were lovingly made - two by my sister, and one by my MIL's friend for the wedding in KL. They hold my wedding invites, cards, church programme etc. Alas, the boxes attract dust, and some parts are already starting to yellow. The crunch came when I found that I could not fit them in the new built-ins under our bed. The contents will be saved in my new chic black boxes (that do fit under the bed), and the angpow boxes will sadly have to go. Sentimentality can be such a burden, don't you think? I like your idea! I think I'll just do that! I had such a strong nesting instinch while carrying meimei that I threw out sooo much stuff! The wedding memorabilia managed to escape. I didnt have an angpow box though. Waha! I have a problem with paper bags too. I have a whole storeroom to work on now. Scary. I agree it is a good thing to declutter, although I think if not for space constraints, I won't be doing so much of it! Aww, they're very sweet. You can actually use them to store Bubbles' stuff, maybe one box for her art & craft materials, one box for her cooking stuff, one box for whatever knick knacks she fancies. Such a waste to throw them away. They are pretty, aren't they? I've already thrown them out! Just as well, when Bubbles saw them she couldn't resist tearing out the decorations =P They were also yellowing and really dusty!